Here on dotTech we participate in Google’s AdSense program, an ad network that allows website owners to display Google ads on their websites and earn commission every time a user clicks on an ad. AdSense is our main source of revenue (read: 80%+) and the reason why we use AdSense is simply because they are the highest paying ad network for medium-to-large-sized blogs like dotTech — by a long shot. dotTech has been running AdSense for roughly five years and I’ve never really had any problems with them. AdSense is easy to signup for, easy to integrate into websites, easy to track earnings, and easy to receive earnings. Overall, it is a splendid ad network which allows webmasters to make a little extra income on the side (or a lot of income on the side, if you are large enough). Today, however, I had an… interesting… experience with AdSense. You see AdSense has a built-in messages module which is used by Google and the AdSense team to send publishers (aka people who signup for AdSense) messages. These messages are not forwarded to email (or at least they aren’t forwarded to my email — I’m not sure if there is an option to enable it), I often don’t read the messages because the AdSense messages module isn’t an inbox I am in the habit of checking. I checked it today, though. Today I logged into AdSense, as usual, to check earnings for the day so far when I noticed three messages sitting in my AdSense messages inbox. I took a peak and two of the messages were equivalent to spam so I ignored them. One message, however, made my heart jump when I read the subject: “Google AdSense: You have 3 working days to make changes to your site”. After reading that subject, instantly I thought “oh crap what is going to happen” but then I noticed the date on the message; it was a message from back in May that I never checked. If your reaction to this message is “WTF“, don’t worry — mine was the same because, essentially, Google tried to control/censor the content posted here on dotTech. Now, to be fair to Google, AdSense and YouTube are both their products/services. So, technically speaking, they have the right to dictate the policies that must be adhered to by anyone that takes part in AdSense. 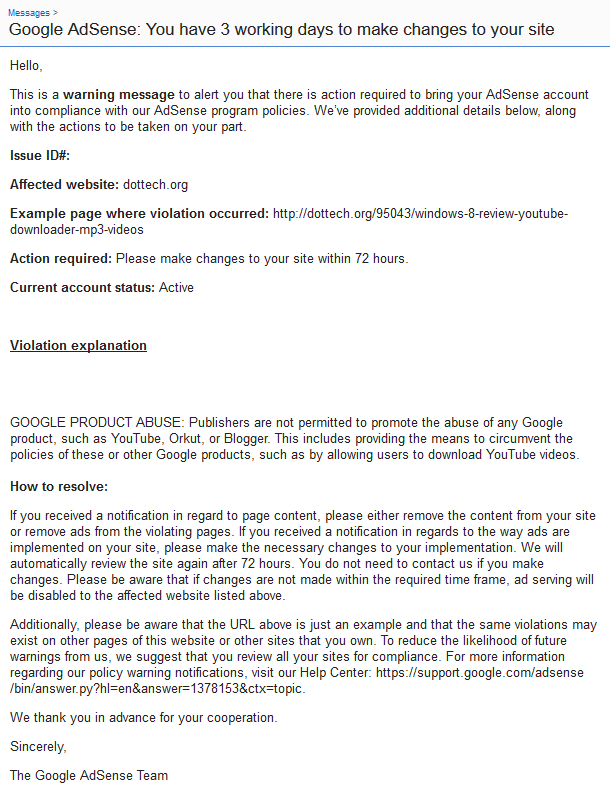 And Google didn’t actually disable my AdSense account (at least not yet). However, I don’t know about you, but trying to more or less blackmail a website (aka do what we say or be banished) into taking down a review of an app (read: take down a review of an app, not the app itself) that does something Google does not want it to do is a bit… evil… in my opinion. 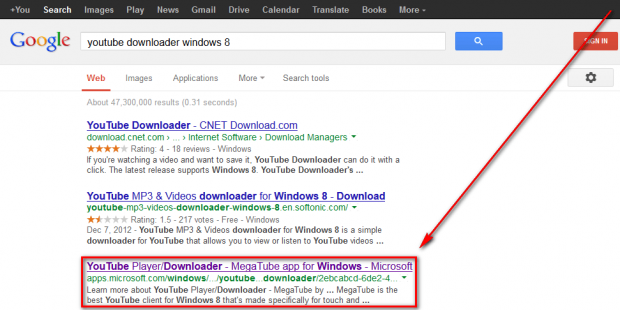 Yes, Google themselves still index and show the Windows Store page for YouTube Player/Downloader – MegaTube yet Google expects dotTech to remove a review we wrote on it. Hypocrisy, anyone? I’m sure some (many?) people will disagree with me here — and, as I’ve said before, Google has the right to dictate terms for their products and services — but this whole incident has left a really bad taste in my mouth. Thankfully, so far Google has done nothing except send that message to me, but what about the future? What will Google do the next time they don’t like content posted on dotTech? I’m not going to leave AdSense over this incident (because they are pretty much the only viable ad network for websites that aren’t large enough to run their own network) but I sure am hoping for an alternative to AdSense, in case Google tries to be evil again. Apparently, freedom of speech only applies when Google is fighting off attempts to censor Google Search results; to hell with everyone else. Feel free to post your thoughts and opinions regarding this matter in the comments  below.